Fundraiser for North Beach Citizens. Famous folks with their fundraising art. Less famous folks with theirs. All for a good cause. BUY! SPEND! DONATE! 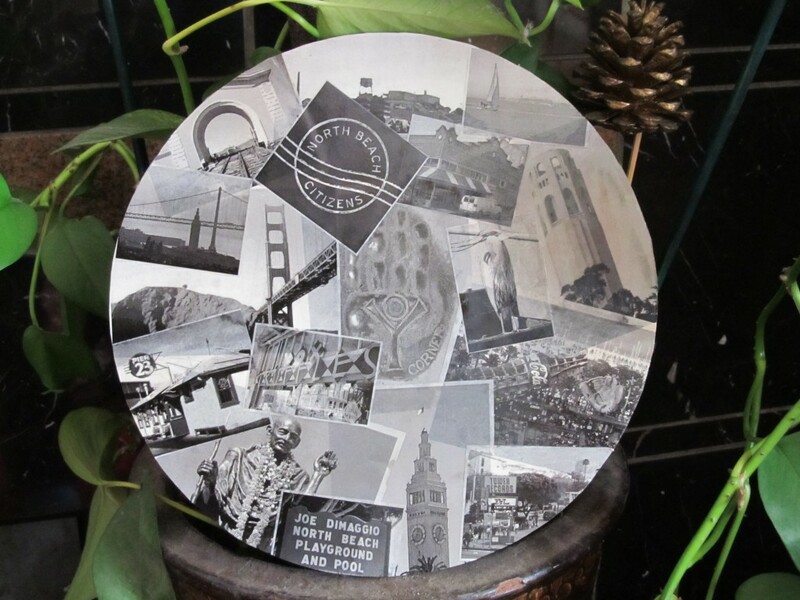 This, of course, is mine — a collage titled, “Cool, Grey City of Love.” Challenge was to take an LP and create some art on it. The theme was VINYL TRANSFORMATION. You couldn’t do something 3-D but anything else was up for grabs. This photo of my collage maybe not so hot, eh? But the collage is worth $5, don’t you think? $10? Who will give me $20 for a GOOD CAUSE! HERE, FOLKS! $50? I haven’t seen what Ferlinghetti, or Hirschman did, and I couldn’t be at the blowout tonight, alas. Check in with Gallery 28 on Grant to see what the other donees did and spend money for a good cause. Couldn’t make it to the opening reception and want to bid in person? There will be a closing reception on 26 March 2011, with poetry reading and auction. Half a Million Nonprofits Could Lose Their Tax Exemptions. Having just FINALLY got final closure on a 501(c)3 after much to-ing and fro-ing with an endless loop of approvals from the Feds and the State and then years after I thought we’d had the final-final step complete, a notice that we were going to be dinged a penalty because we hadn’t paid our corporate taxes, I know how nitpicky and all the paperwork for tax-exempt non-profits is. I know how nitpicky and all the paperwork for tax-exempt non-profits is BUT this is important, folks. If you volunteer with, work for, or give to a smaller nonprofit, make sure the organization’s leadership knows about the 990-N. Encourage acquaintances associated with other small nonprofits to do the same. If they want more information, refer them to the IRS article. Great tale. More great tales on the Travelers’ Tales site. Sunshiney day outside with rain expected off and on through the weekend. Clear skies now, though. Lunch at the Bankers’ Club to enjoy the views. First, though we need to walk down to North Beach Citizens and drop off three bags of warm clothes. I rummaged through our closet. How many warm pullovers and sweaters can you wear at one time? We have more than enough and it’s been so chill recently. Great story of Alfa and Beto, the biblio burros, Luis Soriano, their keeper, and the mission they’ve devoted ten years’ of weekends to. from the site: The Hunger Site launched in June 1999 as the brainchild of a private citizen from Indiana, with the purpose of helping to alleviate world hunger by using the Internet in a creative way. A simple daily click of a button on www.thehungersite.com would give funding — paid for by the site’s sponsors — to the United Nations World Food Programme. In its first nine months, the site funded more than nine million pounds of food for the hungry — an astonishing feat. Eventually the site became too large for one man to manage, and in 2000 The Hunger Site was sold to GreaterGood.com, which today operates as the GreaterGood Network family of websites. The shopshopshop portion of this site is superb as well. Very cool stuffs for those friends and family for whom a gift certificate to Olive Garden just won’t do. Cheap shipping deals too.